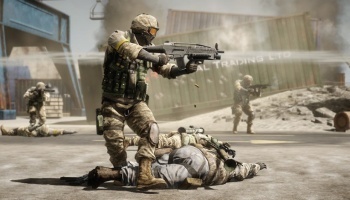 Battlefield: Bad Company 2 is on pace to be the best-selling videogame ever released in the month of March. EA's BBC2 has sold over 2.3 million copies according to internal data. Coupled with some pretty big multiplayer statistics like over 81 billion points earned in online play and 230 thousand peak concurrent users, it's clear that Electronic Arts is touting BBC2 as a huge success. For Swedish developer DICE (Digital Illusions Creative Entertainment), the sales are especially encouraging, even if it was a bit of a surprise. Despite some hiccups with multiplayer support, DICE has added more servers and promise to support more multiplayer matches going forward. "We are so thrilled with the success of Battlefield: Bad Company 2 sales and fan response. In the first 48 hours we had such a tremendous rush to multiplayer gameplay that our servers experienced overwhelming demand. This is a testament to the massive response players have had worldwide for the extraordinary action experienced in the Battlefield sandbox," says Karl Magnus Troedsson from DICE. "DICE and EA have brought more servers online. We now have enough capacity to handle all BBC2 connections seamlessly and we continue to monitor online play daily." While some of this reeks of a publisher trying to spin the fact that servers were down as a good thing, (How could we have known a game released in March would do so well?!) it's good to see them be up front about just what kind of numbers they experienced.